Cindy Trickel reports on the King Center’s Annual Salute to Greatness Awards Dinner for U2log.com. Dr. Martin Luther King, Jr., was one of the most important personalities of the twentieth century because his dream of equality made the entire world think. His ideas were and remain universal, transcending all barriers. One need not be a certain race, religion, or nationality to understand, appreciate, and value Dr. King’s ideas. Because of the universal appeal and application of Dr. King’s ideas, it has been said that he belongs to all people, not just African Americans. 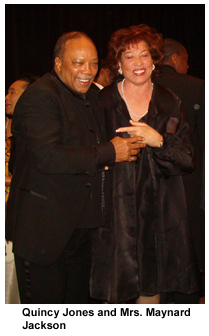 On Saturday, January 17, 2004, that statement was proven true as people of many races, religions, and nationalities gathered to celebrate the legacy of Dr. King at the King Center’s annual Salute to Greatness awards dinner in Atlanta, Georgia. Bono was recognized for his humanitarian work on the issues of debt relief and AIDS in Africa, and for his activism, promoting and working with organizations such as Greenpeace and Amnesty International. The Target Corporation was recognized for contributing more than 2 million dollars each week to educational, art, and social programs that benefit the communities it serves. “If you want to be important–wonderful. If you want to be recognized–wonderful. If you want to be great–wonderful. among you shall be your servant. 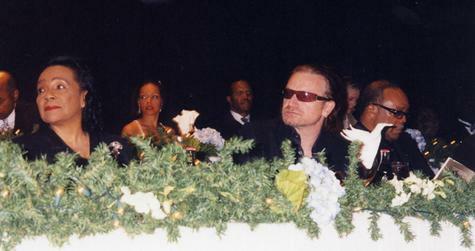 Following Mrs. Coretta Scott King (Dr. King’s widow and the founder of the King Center), Bono took his place at a dressed table at the front of the Hyatt-Regency Ballroom with the King family, dinner hosts, and special guests, among them Bono’s friends, producer Quincy Jones and actor Chris Tucker. The program began with emcee Yolanda King (Dr. and Mrs. King’s eldest daughter) welcoming the honorees and guests. She proclaimed that the dinner was the most successful one for the center in twenty-one years and stated the theme for the dinner program. She promised that before the evening was over, each person’s heart, mind, and stomach would be full. Guests were then treated to the words of Dr. King’s only surviving sibling, his sister Christine King Farris, who was introduced by dinner chairman Jesse Hill, Jr. Mrs. Farris described how her brother’s work was “a model for peace and change” in the world and said that ML–the name she called him through his life–will be remembered as the conscience of a generation. “As long as there is poverty in this world I can never be rich, even if I have a billion dollars. Following comments of praise for the King Center and the King family by Atlanta Mayor Shirley Franklin, Yolanda King again took to center stage to describe the work that the King Center performs and to recognize her mother’s commitment to the center. Calling the center her mother’s “fifth child,” Ms. King hailed her mother’s work as having improved the lives of people all around the world. As she walked to the podium to kiss her daughter, Mrs. King received a standing ovation. 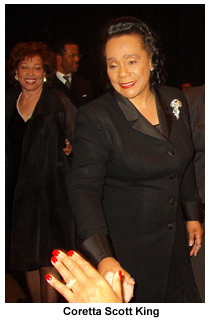 Referencing her daughter’s comment on the number of children in the family, Mrs. King revealed that she had adopted a child that day–an orphan from Ireland. Before dinner was served, the Honorable Barbara Masekala, the Ambassador of the Republic of South Africa to the United States, addressed the audience and encouraged everyone to try to emulate Dr. King’s life. After dinner, guests were invited to sing Stevie Wonder’s version of “Happy Birthday” to commemorate Dr. King’s birthday while Mrs. King lit candles on a cake for her husband, a traditional since his death. 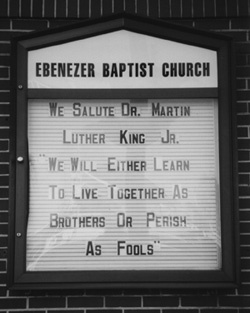 Dr. King would have celebrated 75 years in 2004. “There is nothing in all the world greater than freedom. it is worth going to jail for. I would rather be a free pauper than a rich slave. Mrs. King first bestowed the Salute to Greatness award to the Target Corporation. Accepting for the company was Bart Butzer, the executive vice president of Target Stores, whose acceptance speech focused on the success of the programs that Target Corporation supports involving children. Between presentations, singer Dionne Farris, who is most well-known for her work with Atlanta-based, hip-hop band Arrested Development, provided the entertainment, performing a soul tune that brought Bono and others off their chairs applauding enthusiastically. A five-minute video highlighting Bono’s career and activism was shown before his award presentation. As he watched his life on screen, the singer smiled with humility. 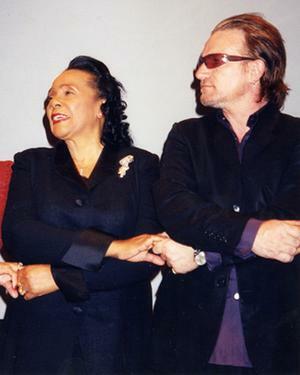 In her award presentation speech, Mrs. King praised Bono as a person who has inspired many artists and people to get involved in issues that benefit humankind and remarked that Bono’s work is in the spirit of Martin Luther King, Jr.
“Bono, my son,” said Mrs King, inviting him to join her at the podium to accept the award. “Mama!” Bono called out and rushed to her side, elicting a response of laughter from the audience. 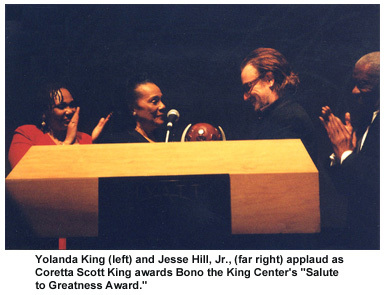 Mrs. King presented Bono with the Salute to Greatness award with her daughter and Jesse Hill, Jr., looking on and applauding. After acknowledging and thanking the King family, Bono recognized his friend Quincy Jones. 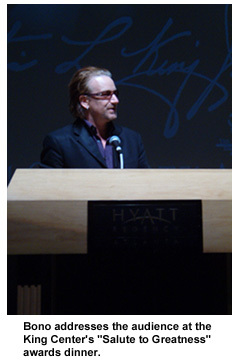 Bono also acknowledged many of Georgia’s musical talents, including producer Dallas Austin, who was in attendance; Jermaine Dupri, whom he noted had “poured his perfection into an Artists Against AIDS project” they are producing; REM, whom he called “the best band in America”; and Elton John, who is actively involved in several AIDS charities and has been a supporter of Bono’s work (Elton John owns a home in Atlanta). But the audience got most excited when Bono spoke of another band from Georgia. Bono’s tone became serious when his speech turned to the topic of Dr. King and how the reverend inspired him. The audience roared in response to Bono’s moving words. “I was in South Africa two weeks ago just to look up at that big sky, to look across this beautiful spirit and these smart people, fighting for their lives and for their dignity. And I realized that we are the first generation that has the resources to refuse the inevitability. We have the science, we have the pharmaceuticals, we might even have the attention of the press and the G8 when they come to Georgia this summer. Let’s let them hear from us. Let’s let them hear,” Bono implored the audience. For the conclusion of his speech, Bono turned the ballroom into a Baptist church, eliciting shouts of praise and exclamation for his words from the audience. The awards program ended with everyone joining hands to sing “We Shall Overcome,” a gospel song associated with Dr. King. Speech transcription by Ruth Barohn for U2log.com. All photos and video by Ruth Barohn and Cindy Trickel for U2log.com. Please do not use the photos and video that appear here on your website or forum without our explicit permission. MLK’s ideas were stolen from the Bible. John 8:28 The Word of God is the only thing that will heal people’s souls in this wicked world. The Word of God and the hope stated within it will never die. That healing is being done now…but you don’t hear about that on the news either. ‘MLK’s ideas were stolen from the Bible’…damn that fraud of a man!! can’t believe you used the word ‘stolen’. Think I should be strung up for stealing all these words from the dictionary. thanks so very much for those two reports…..very inspiring! Thanks for the great report – sounds like a wonderful evening! He was a preacher. He was *supposed* to “steal” words from the Bible! Anyways, great article. @U2.com has a good one, too, if anyone’s interested. Religion is a Scam and a Racket! I chose the word ‘stolen’ very carefully because of the fact that MLK’s statements are taken from the Bible without giving DIRECT credit (glory) to the source. Just because they take MLK out of the context of religion by using Doctor King…doesn’t mean you can stop giving credit to God’s Word. Making personal attacks in this forum is not IN TOPIC; therefore, I appeal to the powers that be to remove such remarks…but then again…this part isn’t really PART of the actually website anymore…now is it? Very interesting article about Ireland. How do you say Love Your Neighbor in Gaelic? very interesting, i for one suggest there is a difference in making a criticical remark in contrast to attacking somebody. Remember what B said about religous fanatics…”Twisitng the words of the bible for their own fanatic benefit”( about Osama BL). MLK as a preacher did not need to source every line, or any line for that matter, that he quoted from the bible. As for not giving ‘glory’ to the source…MLK? you’ve got to be kidding! MLK praised glory to the Lord every 10 words he spoke. MLK spent his last night on earth in a sleazy hotel room with hard liquor and prostitutes. Guess who paid for the prostitutes? Hard-working and poverty-stricken African Americans who were under the impression that their donations were going to be used to advance the cause of freedom. The FBI sealed the records of MLK upon his death, out of respect for some of the good things that the man accomplished. I’m appreciative of some of the good that MLK was responsible for, but for Christ sake can we stop acting like this man was a saint? He was also a corrupt degenerate. never said he was a saint, are you a saint? I was simply stating that he does not have to source the bible when he quotes from it. To call him a corrupt degenerate is not even worth responding to as you will have to answer for that one on your own. If any of Dr. King’s critics had to face, for one second, any of the life-threatening opposition that he, the Freedom Riders, or any of the civil rights workers had to face while they pursued their work, they would run into a closet and wet themselves like terrified poodles. If ignorance is bliss, there must be a few hysterically happy people posting here. Hey Micky- What’s your favorite U2 song? There will be no disrespecting Dr. King — or anyone for that matter — here. Remember, this is a U2 fan site, not a place to debate morality. Please keep your comments polite and related to the topic. Seriously, Micky- and no disrespect either, but start from the top. J.Edgar Hoover was by no means an MLK fan, check those facts out. In no shape or form did MLK ever canonize himself, and neither would the people who knew him. He was a baptist preacher, and priests/preachers/reverends will tend to quote and draw reference from the bible- it’s part of the job description. The motel was cheap and would allow blacks without a hassle, King had returned to Memphis after the first attempt to peacefully demonstrate had failed. Andrew Young and several others had been testifying in court on April 4, MLK was out of sorts- see the footage of his “I have see the Promised Land… I may not get there with you” speech at the Memphis church on the evening of April 3rd, he does not look well. He was shot while on the balcony on the way to dinner. MLK was not a rich man and did not make much money. He endorsed the entire proceeds of the Nobel Peace prize to the advancement of the cause, one that took precedence over anything he did. When is the last time any of us thought of giving up everything we are doing for the better of others? Does that make him a saint? I don’t think so. But at the very least he gets my respect as a human being. So, please, get the facts straight, then distort them as much as you want…. PS. This isn’t Evan “Micky” Meckam is it? (I) reject to accept the idea that man is mere flotsom and jetsom in a river of life unable to influence the unfolding events which surround him. I refuse to accept the view that mankind is so tragically bound to the starless night of racism and war that the bright daybreak of peace and brotherhood can never become a reality. I refuse to accept the cynical notion that nation after nation must spiral down a militaristic stairway into the hell of thermonuclear destruction. I believe that unarmed truth and unconditional love will have the final word in reality. This is why right temporarily defeated is stronger that evil triumphant. I believe that amid today’s motor bursts and whining bullets, there is still hope for a brighter tomorrow. I believe that wounded justice, lying prostrate on the blood-flowing streets of our nations, can be lifted from this dust of shame and reign supreme among the children of men.